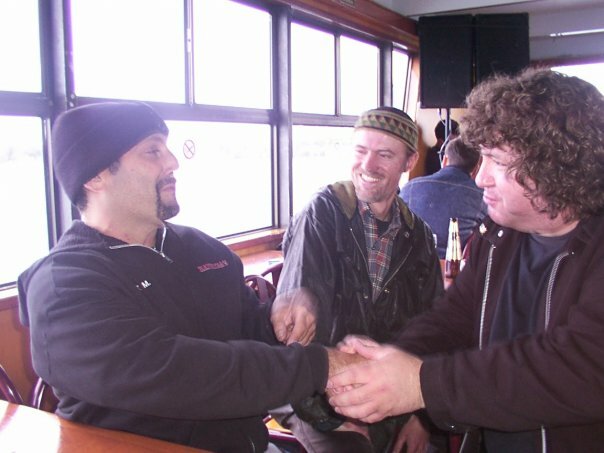 As a follow-up to our previous post about the Australia tour, here’s a great shot from the 8/25/02 Sydney Harbour Cruise of the Handsome One exchanging a “good onya”’ with Bill Gibson of the Eastern Dark. The Eastern Dark was a fantastic Australian band back in the 1980s, whose “Johnny and Dee-Dee” 45 belongs in every music library that’s worth a toss. They used to cover “Minnesota Strip” back in their early days, and were gobsmacked when the Master Plan returned the honor by covering “Walking” on their first lp.